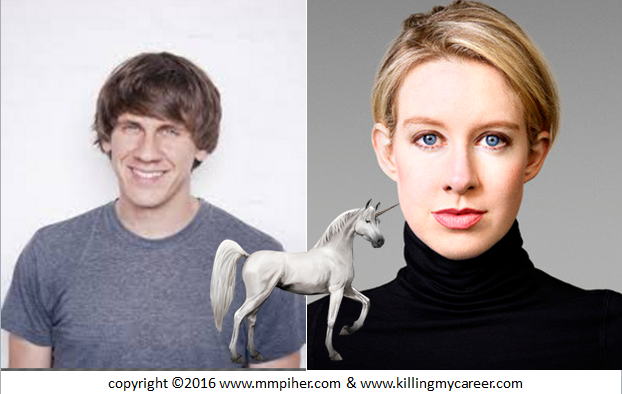 In previous writing from this site, 2015 Startup Trend: Startup CEO’s Unemployed and or Behind Bars I predicted the removal of startup alleged unicorn Foursquare CEO Dennis Crowley; and, it appears VC backers have finally caught on and are replacing Crowley with COO Jeff Glueck now as the company’s new CEO. A year later. Crowley, as is now Glueck, nothing more than a CEnO, or an underqualified executive, easily manipulated by the venture capitalists, who likely created false sales projections which created false hypergrowth for a fraudulent overvaluation, and is nothing more than fraud, all as a means to get a quick RIO for investors without regard to employees, consumers, shareholders or taxpayers. A little something I personally know about from the NEA & JJDC funded, ExploraMed incubated, Menlo Park, CA, med tech startup Acclarent which was purchased by JJDC’s parent company Johnson & Johnson’s subsidiary Ethicon in 2010 for $785 million, where I worked from June 2007, started questioning unchecked sexism, retaliation and false projections in 2008, and was wrongfully terminated in 2011 for further questioning unethical and illegal corporate behavior. Your typical startup fairy tale turned nightmare; but, none more so than for Johnson & Johnson’s Ethicon’s Acclarent’s (then) CEO William (Bill) Facteau*, or CEnO, and VP of Sales & Training Patrick (Pat) Fabian* who were arrested by the Department of Justice on April 9, 2015 and pending trial for 18 counts of fraud. VCs need someone to take the fall for fraud and nothing like eager underqualified executives (ahem Crowley & Glueck) stepping up to the plate willing to take the potential jail time. Which, for the record still makes the executives complicit with the crimes and per the Yates Memo should see a lot more executives behind bars, they only way to change the industry. This is one disruption I fully support. *Awaiting trial: Facteau is currently CEO of NEA & JJDC funded EarLens and Fabian is currently COO of Ally Bridge & Boston Scientific funded startup NxThera despite the company unethically removing his name & image from the website. Startups are notorious for using innovation as a manipulation to ignore the law and contrary to popular startup myth, the feds are watching startups more closely, now more so than ever, just ask Theranos CEO, Elizabeth Holmes, who rightfully so is under fire again for deficiencies found at the company’s lab. This site under The Sociopathic Business Model™ views people in one category, first, as it relates to business: Abusive or Non-Abusive where all other subcategories just further describe the main category, meaning that while Elizabeth Holmes is a woman and typically women in startups are discriminated against, Holmes has acted abusively towards the law, patients, consumers, and ultimately, therefore making the criticism against her as the company’s CEO justified and not sexist. Theranos is following a similar pattern to what I experienced at Acclarent. 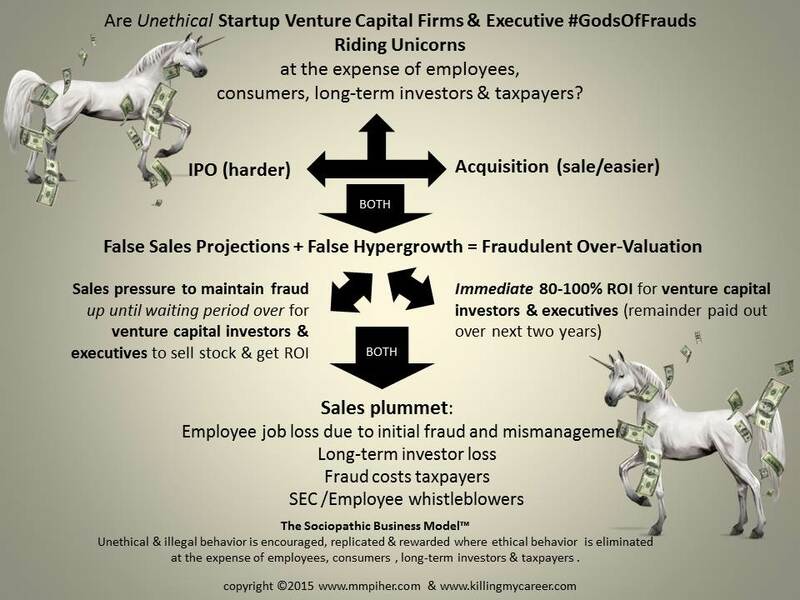 The company tried to skate by getting a 510 (k) approval and were previously able to run 200 tests (now one), creating false projections + false hypergrowth=fraudulent overvaluation, this is fraud, again for the benefit of the VCs and not employees, consumers, patients, long-term shareholders and taxpayers (who eventually pay to clean up these messes). Acclarent went a similar road by fraudulently obtaining a 510 (k) for the company’s Stratus Microflow Spacer; and, something Acclarent’s eventual parent company, Johnson & Johnson did regarding the 510 (k) for KY-Jelly where both companies “decided,” while under federal subpoenas, to discontinue selling the products, which were already creating positive cash flow in the millions to billions, and in the case of KY-Jelly forcing the sale of the billion-dollar division. Any time a company decides to opt not to fill out paperwork for a product they’ve made millions to billion on, it’s a red flag, where likely there’s a deal between the company and feds behind closed door that goes a little something like: “If you don’t pull this product we’ll prosecute and it’ll be a public image nightmare and blood bath.” That’s usually enough for a company to decide to pull their money maker from the market. Expect a press release where Theranos “decided,” to cut the money maker out of their business model, just like Acclarent and Johnson & Johnson decided. The Johnson & Johnson Ethicon Acclarent Department of Justice case has helped, CMS, FBI, DOD, FDA OIG-HHS look more closely at where exactly to find fraud in med tech startups, let’s just hope they’re also paying attention to what’s happening in tech startups. Bottom line: Startup unicorns don’t exist without fraud. VC funded Uber’s CEO Travis Kalanick and Twitter’s CEO Jack Dorsey, this should serve as a cautionary tale and, more so to employees, consumers, patients, shareholders and taxpayers.